Pull up for training and matches with your mates these Tottenham Hotspur 16/17 Home Football Socks, made by Under Armour, and prove your loyalty to Spurs whilst getting a quality performance.These official home socks of North London Premiership club Tottenham Hotspur are fully optimised to help you get a Premier League class performance on the pitch and feature a combination of technical features to achieve this, including UA ArmourDry and ArmourBlock.ArmourDry is designed to help keep your feet feeling dry and refreshed and does so by absorbing sweat and quickly evaporating. This combines with ArmourBlock which prevents the development of odour causing bacteria. In addition to that, cushioning in the sock improves comfort and helps alleviate the pressure on your feet during a long and intense match. 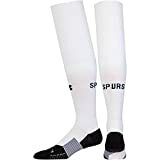 Match ready and designed for a performance worthy of any Spurs player or fan, make sure to pull up a pair of these Tottenham Hotspur 16/17 Home Football Socks for your next big match.